Chateau Cambon La Pelouse dates back to the 1700′s, when it founded by the Cambon family. Like numerous Bordeaux chateau, the estate has had numerous owners over the centuries. During the 1800’s, Chateau Cambon La Pelouse shared owners with Chateau Cantemerle. However, the true modern era begins when the property was purchased by Jean Pierre Marie, who added the small production wine, LAura de Cambon from vines planted in the Margaux appellation to his portfolio a decade later, in 2006. Claude Gros was the initial the consultant for the vineyard management and the wine making at L’Aura de Cambon. That changed in 2013, when the new owners brought in the noted consultant Hubert de Bouard of Chateau Angelus to act as their consultant, in the vineyards and the cellars. The 60 hectare Haut Medoc vineyard of Chateau Cambon La Pelouse is planted to 52% Merlot, 44% Cabernet Sauvignon and 4% Petit Verdot. The current vineyard plantings show a change in their makeup, as all the Cabernet Franc has now been removed. The vineyard is well placed in the commune of Macau, not far from Chateau Cantemerle and Chateau Giscours. On average, the vines are 25 years of age. The vines are young because the majority of the vineyard was replanted in 1975. The vineyard needed replanting because after it was decimated in the frost of 1956, the vineyard was abandoned, as it was too costly to replant for the owners at the time. It remained fallow until it was purchased by Jean Pierre Marie. The terroir is mostly gravel and soils with small rocks and stones. The vineyard is planted to a vine density of between 5,000 vines per hectare and 7,000 vines per hectare. The higher levels of vine density are for the newer plantings. Like all Bordeaux estates, the blend changes from year to year. In some vintages, Chateau Cambon La Pelouse uses one of the highest portions of Merlot in the Left Bank. For example, in 2001, the wine was produced using 60% Merlot in the blend. To produce the wine of Chateau Cambon La Pelouse, most of the grapes are machine harvested. Following a five to seven day period of cold soaking at an average temperature of 6 degrees Celsius, the wine is fermented in temperature controlled, stainless steel vats that range in size from 88 hectoliters up to 200 hectoliters. Recent renovations added enough steel tanks to allow for vinification on a parcel by parcel basis. 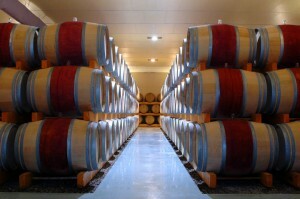 Malolactic fermentation takes place in a combination of French oak barrels and stainless steel vats. The wine that endures malolactic fermentation in barrel is aged on its lees for six months. Cambon La Pelouse is aged in between 40% and 50% new, French oak barrels for an average of 20 months. On average, Chateau Cambon La Pelouse produces close to 15,000 cases of wine per vintage. There is a second wine, Chateau Trois Moulins, which often contains as much as 40% Cabernet Franc in the blend. Chateau Cambon La Pelouse needs some time before it can be enjoyed. Young vintages can be decanted for an average of 1-2 hours, give or take. This allows the wine to soften and open its perfume. Older vintages might need very little decanting, just enough to remove the sediment. Chateau Cambon La Pelouse is usually better with at least 5-7 years of bottle age. Of course that can vary slightly, depending on the vintage character. Chateau Cambon La Pelouse offers its best drinking and should reach peak maturity between 6-14 years of age after the vintage. Chateau Cambon La Pelouse is best served at 15.5 degrees Celsius, 60 degrees Fahrenheit. The cool, almost cellar temperature gives the wine more freshness and lift. The wine of Chateau Cambon La Pelouse is best served with all types of classic meat dishes, veal, pork, beef, lamb, duck, game, roast chicken, roasted, braised and grilled dishes. Chateau Cambon La Pelouse is a perfect match with Asian dishes, hearty fish courses like tuna, mushrooms and pasta as well as cheese. A well-priced, easy drinking, soft textured, medium-bodied wine that is already showing its earthy, bright fruit and tobacco charms. This is not for aging, it is, however perfect for near term consumption. Fresh with flesh, the fruit is on the bright side and I really like the earthy, spicy accents. This is a nicely priced wine that will drink well early. Medium bodied, with juicy, sweet ripe fruits, soft, polished tannins and an oaky presence in the finish, this should be better if the oak merges a bit better into the wine. Well priced, easy drinking, soft textured, medium bodied, Haut Medoc wine that is already showing its earthy, bright fruit, tobacco and earthy charms. This is not a wine to age but a wine for current pleasure. Pleasant quaffer with round textures, licorice and black cherries that is already open and ready to drink. Enjoy this on the young side. Easy drinking charmer with soft, round textures, medium body and an earthy, red fruit presence with the added complexity of thyme, tobacco and smoke. Charming, reasonablyl priced and already drinking well, the medium bodied, open wine, offers licorice, oak, black cherry, earth, cassis and round textures.